Ithaar Derweesh, MD, urologic oncologist, UC San Diego Moores Cancer Center. Researchers at the University of California, San Diego School of Medicine have released study results that show national treatment trends in the surgical management of patients with kidney disease. The study found that partial and complete kidney removal (total nephrectomy) and energy-based techniques to destroy tumors are all on the rise. Surprisingly, the patients most in need of kidney-sparing surgery are still more likely to undergo total nephrectomy. The findings recently published online in BJU International. 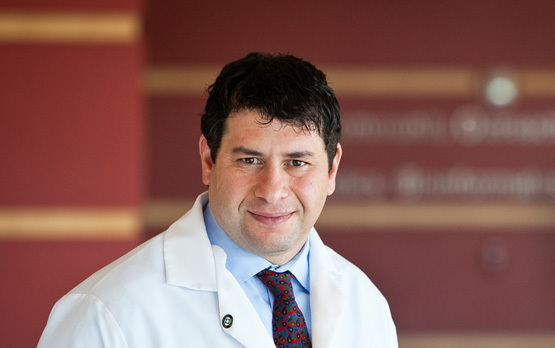 “While the overall proportion of patients receiving kidney preserving treatments for localized kidney tumors continues to grow, the most significant, and perhaps unsettling finding was that patients with kidney insufficiency still undergo complete kidney removal – even though kidney preserving treatment may be indicated,” said senior author Ithaar Derweesh, MD, urologic oncologist at UC San Diego Moores Cancer Center. The kidney is a vital organ which performs a variety of functions in addition to making urine. It controls blood pressure, bone health, and also makes a hormone to tell the bone marrow to produce red blood cells. Kidney insufficiency is characterized by a progressive decline in kidney function which may affect all of these actions. “The study, which examined procedures over a 10-year period, found that patients with chronic kidney insufficiency had an almost two-fold higher probability of undergoing total nephrectomy than kidney preserving treatments, such as partial nephrectomy or tumor ablation,” said Derweesh, a pioneer in minimally invasive kidney surgery. Derweesh added that further investigation is needed to confirm these findings, and to examine what factors are responsible for patient and physician selection of treatment for kidney cancer. He noted that in the case of small renal masses less than four centimeters in size, partial nephrectomy has equivalent outcomes to total nephrectomy, and that ablation techniques, such as cryoablation or radiofrequency ablation, and observation are valid options for select patients. While kidney insufficiency may result in total failure of the kidney, most patients do not progress to dialysis dependence. However, patients with worsening degrees of kidney insufficiency are at higher risk of cardiac events, such as heart attack and stroke, and osteoporosis and anemia. The UC San Diego study utilized data from the Nationwide Inpatient Sample (NIS), the largest database of all annual hospital admissions in the United States. Approximately 443,850 procedures were included in the study. Chronic kidney disease (CKD) is a condition characterized by a gradual loss of kidney function over time and affects more than 26 million American adults. The two main causes of chronic kidney disease are diabetes and high blood pressure, which are responsible for up to two-thirds of the cases. Renal cell carcinoma is a commonly diagnosed urological malignancy with an estimated 57,760 new cases and 12,908 deaths in the United States during 2009. Study contributors include: Jeffrey Woldrich, MD, Kerrin Palazzi, MPH, Sean Stroup, MD, Roger Sur, MD, J. Kellog Parsons, MD, and David Chang, PhD.